Media can mobilize emotions in order to subordinate them to the political goals of state power. Nowhere is this statement more unquestionable and self-evident than in the representation of war by audiovisual media. It is widely assumed that war and propaganda films can move individuals to change their political convictions, to neglect their material interests, even to give up their basic impulses at self-preservation. But how does it work? How do media experiences convey affective attitudes that shape individual patterns of perception and judgment? In fact, history knows a host of instances - from the First World War to the current conflicts in Iraq and Afghanistan - that attest to the propagandistic persuasive power of audiovisual images. But as much as we may know about the intentions and effects of media politics, we know very little about the way media access the patterns of affectivity and meaning-making of individual beings. My questions are focused above all on these ‘tools of manipulation’. However, we consider the term manipulation to be insufficient. Indeed, it is not a matter of manipulating the emotions and attitudes that every individual spectator brings forth as his or her biological and intelligible essence. Rather, it is a question of cultural practices in which a feeling of belonging to a community is created and formed in the first place. We assume that feelings of community cannot be observed and understood outside these cultural practices that are defined through the goal of bringing forth and mobilizing precisely such a feeling. The Hollywood war film genre is a striking example of such a cultural practice. It aims to produce and modulate an affective relationship to the political community and its history. It seeks to mobilize a feeling of belonging to a political community shared by many individuals. That is, it seeks to mobilize a sense of community or a sense of commonality. But how can we understand this idea of a “sense of community” more concretely, and related to the media production of war? This sense of community is not to be found on a level of represented facts or emotions; it is not a matter of contents. Rather, it structures the emotional evaluative attitudes and stances toward the moral-political issues and historical information communicated by the films. We situate our use of the term within the theoretical discourse of the terms community, sense of community and sensus communis in political philosophy, and especially within the strand that relates (a theory of) the political to categories of aesthetic experience. Alongside Jacques Rancière‘s concept of a “Politics of Aesthetics” (2004) and other well-known considerations within these debates (e.g. Cavell 2004), two positions form the bottom line for our understanding, namely those of Richard Rorty and Hannah Arendt. We now want to refer to them very briefly. Richard Rorty (1998) attempts to conceive the sense of community as a dynamic element of a society in an open historical process, which must always configure itself anew as a community. In pluralistic, democratic societies, the sense of community cannot rely on genealogically derived formations of community. It is rather based upon agreements in emotional and moral judgment that cannot be justified apart from the fact that they constitute commonly shared values. The Sense of Community has to be produced as the affective agreement to commonly shared values in concrete cultural practices. In an earlier, very different context, Hannah Arendt developed a theory of the political that explicitly connects the sense of community with the mode of aesthetic experience. In her reading of Kant's Critique of Judgment (Arendt 1992), a spontaneous “feeling of belonging to the world” can be grasped in the aesthetic judgment of taste, an "extra sense [...] that inserts us into a community” (ibid. : 70; see also Arendt 1958 and Arendt 1963). If I experience something as beautiful, then I put my feeling in relation to others who experience the world of appearances in the same way. And if I judge an action as bad, then this judgment is based on the significant feeling of sharing my sensation with all those who belong, as I do, to the human community. From this perspective, the sense of community is closely associated with the modes of aesthetic experience. This association denominates the level of connection between a sense of community and the specific individual‘s embodied feelings of selfhood. And it is this interweaving of the subjective reality of a concrete sensation of the self with a feeling for the political community that designates the junction at which Hollywood cinema is connected to the political-historical events of war. 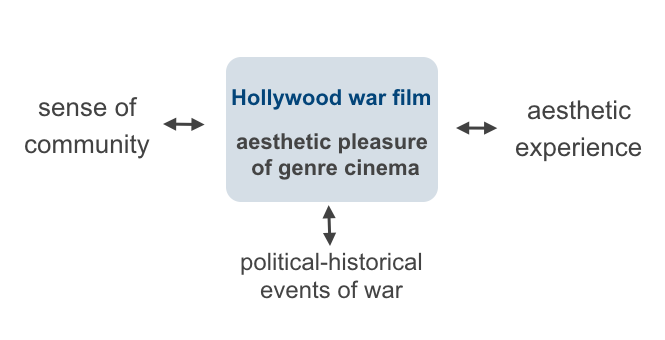 The central question here is how historical experiences and the cultural phantasms of war are joined with the spectators’ affective sensations in the aesthetic pleasure of genre cinema. Hence, war films do not only provide a historical specification of the depicted events but, more importantly, of their spectators as well. They address a highly contingent and shifting sense of community. In the following, I would like to explain this approach by means of a case study that compares Frank Capra’s Why We Fight series (USA 1942-1945) with a film of Leni Riefenstahl’s: Tag der Freiheit - Unsere Wehrmacht (Day of Freedom - Our Armed Forces, GER 1935). 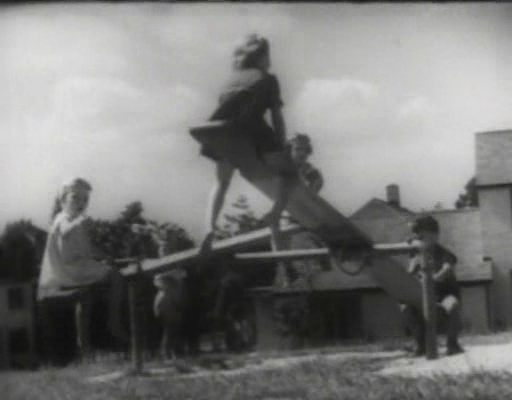 Leni Riefenstahl's short film was produced on the occasion of the reintroduction of the “Allgemeine Wehrpflicht”. Just like Capra‘s series of films, it addresses young recruits that are yet to be initiated into the war. Fig. 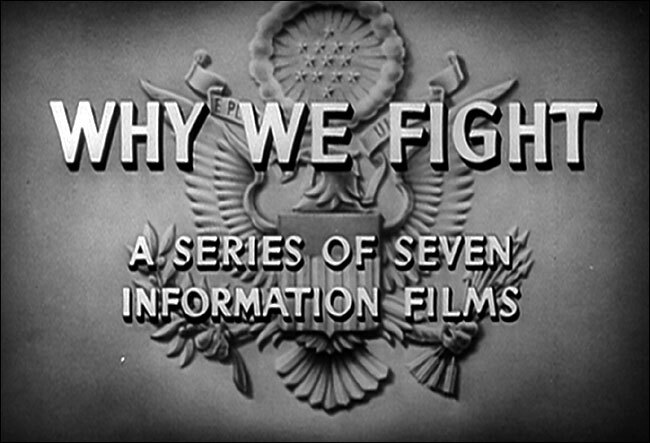 2: Titles for Frank Capra's WHY WE FIGHT series (USA 1942-1945). Both films unfold the ethos of belonging to the singularity of the community, both target the pathos of self-sacrifice as the pledge or precondition of this belonging. And yet it is hard to imagine a greater contrast than that between their poetic concepts! Fig. 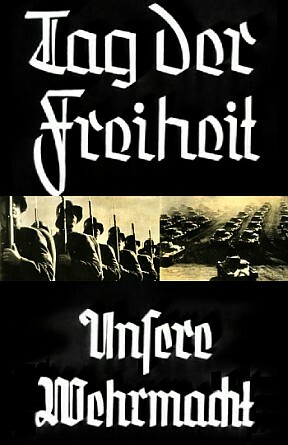 3: TAG DER FREIHEIT - UNSERE WEHRMACHT (DAY OF FREEDOM - OUR ARMED FORCES, Leni Riefenstahl, GER 1935). 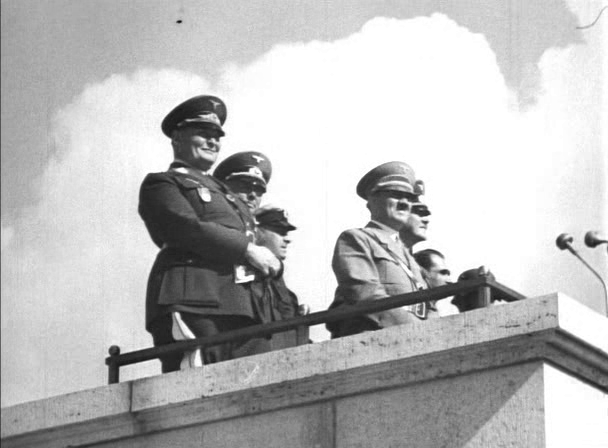 Riefenstahl’s film has a clear division. An epilogue shows a group of young men stripped to the waist at their morning wash. We see laughing faces, youthful bodies, the joy of morning. Fig. 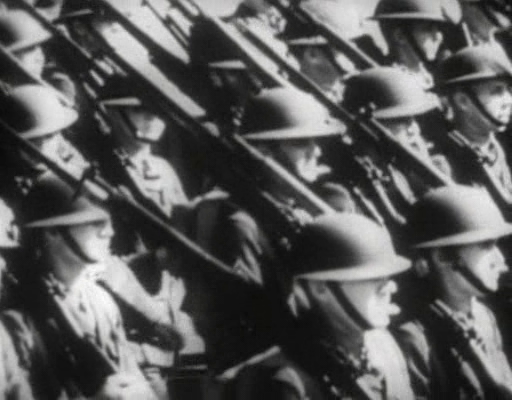 4: Still from TAG DER FREIHEIT - UNSERE WEHRMACHT (Leni Riefenstahl, D 1935), Min. 3. Fig. 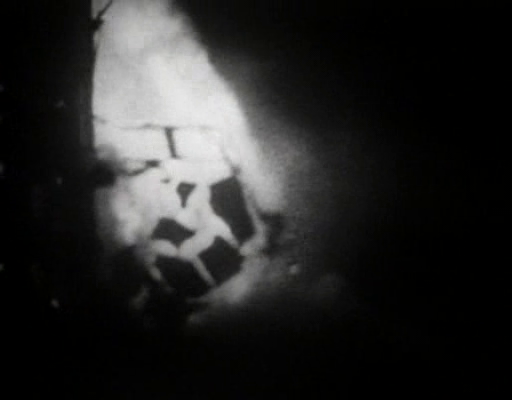 5: Still from TAG DER FREIHEIT - UNSERE WEHRMACHT (Leni Riefenstahl, D 1935), Min. 3. This is followed by an interlude showing soldiers on foot and on horseback. 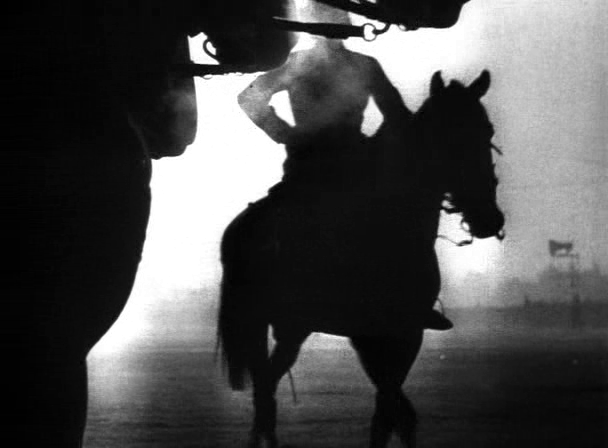 Through highly stylized camera perspectives and artfully orchestrated mists, they have traded in their everyday corporality for uniforms, riding poses, and shots from below. Clip 1: TAG DER FREIHEIT - UNSERE WEHRMACHT, Leni Riefenstahl, Deutschland 1935 (00:01:25 bis 00:03:32). 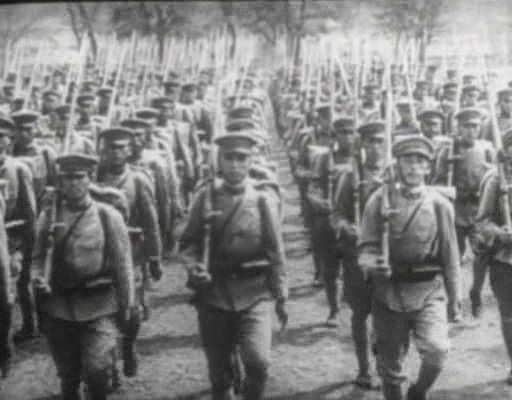 Following this we see the soldiers’ deployment, marching into a stadium; they march past the audience and the tribune of generals. The soldiers fall into the strict order of the Führer’s review. This is followed by a speech by Hitler to the newly recruited soldiers. In ornamental tirades, he continually varies the same metaphor. The young men can and should trade in their debased physical existences for their participation in a body that is equally abstract and heroic–the newly established corpus of the German man, the armed forces of the fathers. What then follows are the steps of just this transition, staged as the fusion of human material with technological material. Clip 2: TAG DER FREIHEIT - UNSERE WEHRMACHT, Leni Riefenstahl, Deutschland 1935 (00:06:38 bis 00:12:49 Minute, zensurierte Filmversion). Once again we see soldiers–faceless beneath their helmets–marching past the grandstand. This proves to be the opening of a maneuver: infantrymen throwing themselves onto the ground and shooting. Then, in a more or less strict escalation by the rules of a child‘s outdoing play, we see soldiers on motorcycles, in cars with cannons attached, then light track vehicles, armored cars, and finally tanks. 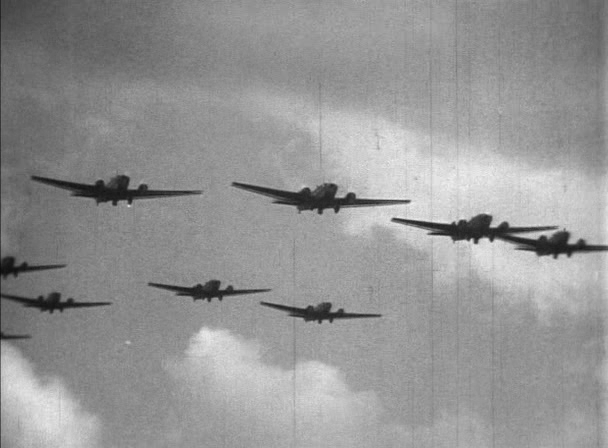 The attentive gaze into the heavens by the Nazi elite announces the final stage: the air force (Luftwaffe). Through the elaborated rhetoric of dynamic montage sequences, an image of strictly methodical annihilation appears: The everyday body introduced at the beginning of the film is the object of a ritual dressing that obliterates this body. This obliteration forms the basis for the life of the troops, the marching line, the battalion, the division, the army, and the nation. 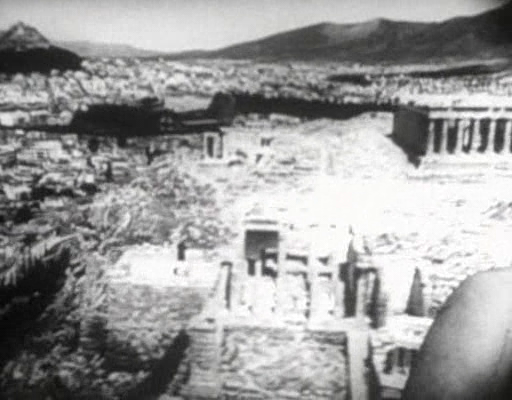 But the emotional sensation that attempts to tie the audience to these forms of community is based on a fundamental aesthetic mode of experience in the cinema: namely, the capacity to provide a dynamic element to the spectator’s space of perception and sensation, extending far beyond the scope of everyday perception. We know this mode from avantgardistic concepts of cinema: as an illusion of a gaze that, since it is rooted in the idea of the amalgamation of technology and the human body, can overcome even the most complex figurations of time and space. Here, this potential of a dissolution of perception is used to turn Hitler’s position into an aesthetic experience for the movie spectator. From this perspective, the war itself becomes a spectacle of socialization. What is staged is the obliteration of everyday life as a solemn sensation of community, which the audience can take part in through their aesthetic pleasure. It is this ideal of community, which can be grasped in the calculated staging of the images, which leads Capra to believe that these images could be turned against their creator. Fig. 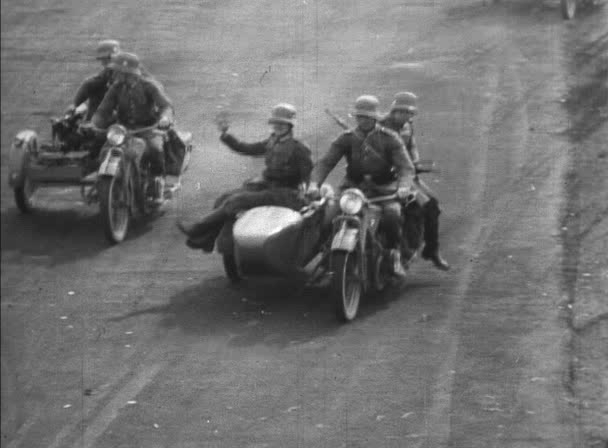 6-11: Stills from TAG DER FREIHEIT - UNSERE WEHRMACHT (Leni Riefenstahl, D 1935), Min. 4, 5, 7, 11, 14, 8. Fig. 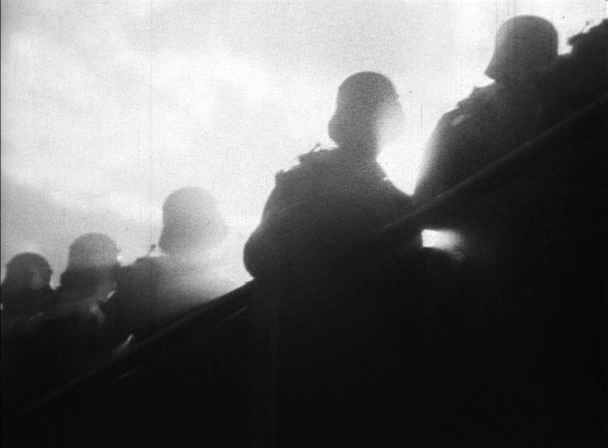 12: Still from TAG DER FREIHEIT - UNSERE WEHRMACHT (Leni Riefenstahl, D 1935), Min. 6. 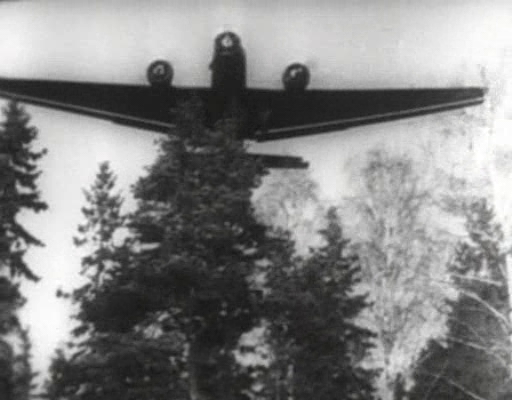 Clip 3: Why We Fight: Prelude To War, Frank Capra, USA 1942 (00:01:29 bis 00:03:58). First and foremost, these questions directly address the troops: the soldiers in the training camps and on their way in ships and planes that will take them to the most remote parts of the globe. Even if they seem to have a purely rhetorical function, an answer can only be given and fully understood as the film has run its course to completion. At first the questions are associated with the image of marching American soldiers, bright uniforms, music, casual marching, and individual faces. Fig. 13-15: Stills from WHY WE FIGHT: PRELUDE TO WAR (Frank Capra, USA 1942), Min. 2. Then, in a sharply polemical tone, the film scans over possible answers. The theater of war around the world is called up. 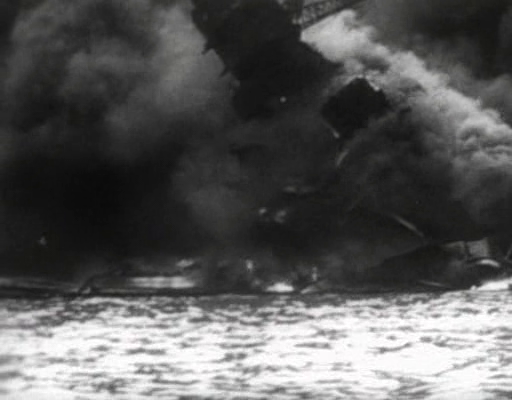 The recognizable images from newsreels trace out a mental movement for the audience, which is pursued and structured by the off-screen voice: "Is it because of Pearl Harbor…?! Because of Poland, China, Russia? Any way you look at it, it involves the whole world." Fig. 16-19: Stills from WHY WE FIGHT: PRELUDE TO WAR (Frank Capra, USA 1942), Min. 3, 3, 3, 4. 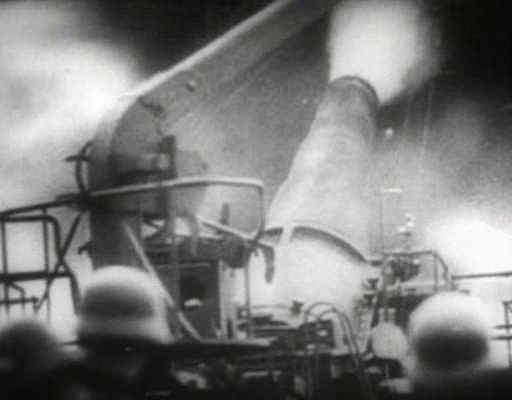 The montage thus formulates a stream of associations in which weapons technology – images of cannons, tanks, airplanes – is time and again placed in relation to images of destruction: detonating buildings and exploding landscapes, burning ships, scattering masses of people. 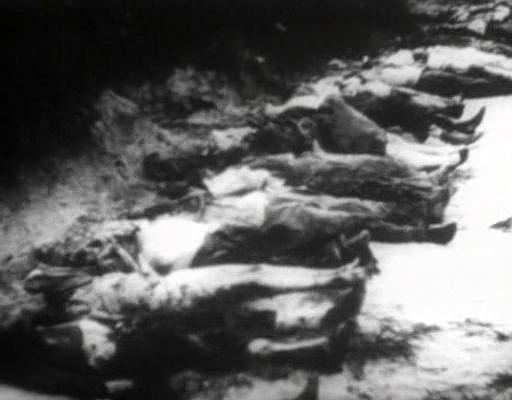 Reinforced in the thundering of the noise of battle, the staging of the powers of weapons technology is related to its opposite: to images of wounded human bodies, killed and injured children, horrified, desperate women, oppressed men – rows of corpses. Fig. 20-22: Stills from WHY WE FIGHT: PRELUDE TO WAR (Frank Capra, USA 1942), Min. 4, 4, 3. Fig. 23-25: Stills from WHY WE FIGHT: PRELUDE TO WAR (Frank Capra, USA 1942), Min. 3, 2, 4. Fig. 26-28: Stills from WHY WE FIGHT: PRELUDE TO WAR (Frank Capra, USA 1942), Min. 3, 3, 4. 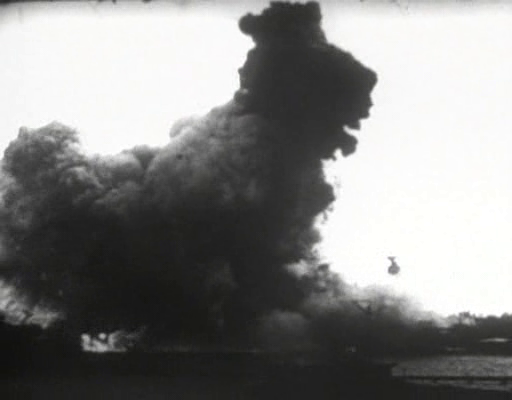 The staccato of the raging accusations is carried by a montage of found footage, which is condensed into an affect-laden formula of pathos–a well composed expressive movement image. Its principles of composition can be summarized according to four aspects. 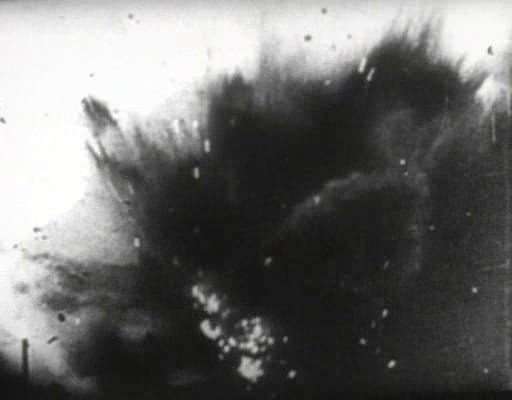 First, the contrast of bright and dark sequences structures the perception on the level of alternating shots: Images of explosions that desintegrate whole landscapes in a flash of bright lightning are answered by images of smoke and darkness. 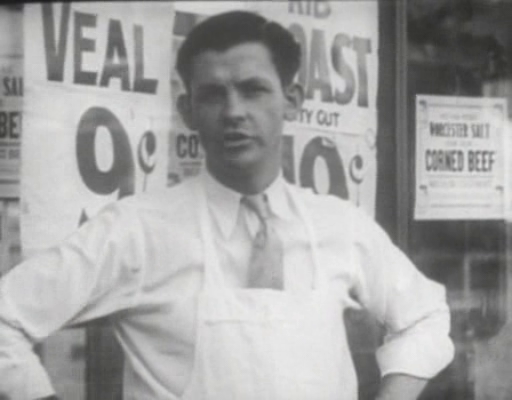 Clip 4: Why We Fight: Prelude To War, Frank Capra, USA 1942 (00:01:58 bis 00:02:20). Second: There is an abundancy of double and multiple exposures, superimpositions, the fusion and layering of multiple images or multiple levels of imagery: For instance, the ghostlike row of tanks that rolls over cities, ruins and a line of corpses on a country road. These superimpositions connect the flashes of explosions and gun fire, the dark smoke and the other images of battle and destruction into a single, continuous process of morphological transformation. Clip 5: Why We Fight: Prelude To War, Frank Capra, USA 1942 (Zusammenschnitt). Third: the ongoing alternation of opposite movements within the frame: vertical, horizontal, diagonal, left to right and right to left, etc. This alternation translates the struggle of powers, as it is declared by the voice-over, into an audiovisual perception of opposite dynamics in a process of steadily increasing tension. 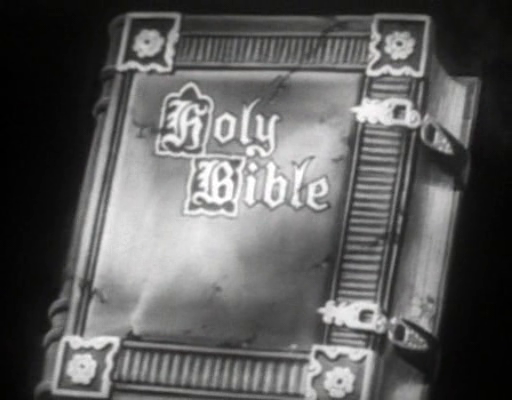 Clip 6: Why We Fight: Prelude To War, Frank Capra, USA 1942 (Zusammenschnitt). Finally: the temporal unfolding of the entire montage sequence is structured by the symmetry and rhythm of reoccuring elements: the large guns shooting at the sky that reappear for very short durations on the left and on the right. Their thundering in sound and image functions like a colon or double dot that demands and receives an answer from the voice-over‘s speech. Clip 7: Why We Fight: Prelude To War, Frank Capra, USA 1942 (00:02:17 bis 00:03:13). Comparable to a musical composition, the perceptual process of the spectators is organized as a structured sequence of dynamically contrasting sensations. Every aspect, every single moment of the spectators' perceptual experience is a transitory phase within this expressive movement, as it unfolds in time. And this continually unfolding expressive movement is, at each moment of its unfolding, connected and interwoven with the recognition of iconic images, of motifs, the realization of the speech‘s semantic meaning, the grasping of audiovisual formulas. Hence, what emerges is the precious commodity that every propaganda film seeks to create: the impression that one can see, feel, and understand the world spoken of here in one and the same stroke; what emerges is evidence for the senses. The evidence that the world of which I am being told is visible there on the screen, and that everything that is visible there can be unlocked and evaluated directly as an affective experience. It is this aesthetic evidence that gives the off-screen voice its power. 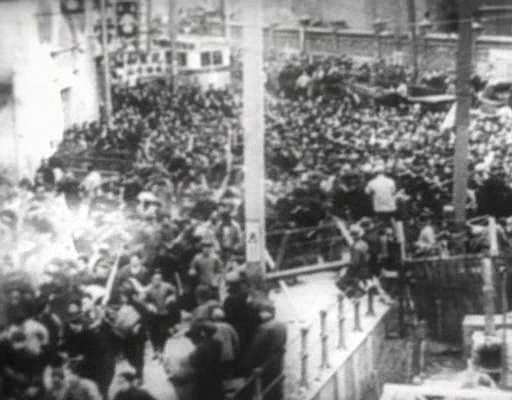 In view of this process, Capra’s film does not in fact differ from that of Leni Riefenstahl. But what is added into the cinematographic image here is precisely that perspective that is cut out in Riefenstahl‘s film: The physical vulnerability of individual bodies forms the opposite pole to the destructive power of weapons technology. These two poles are depicted in Riefenstahl‘s film in a unidirectional process of a force that is continously enhanced. But here it becomes the experience of a clash of two very different, very mismatched forces. It is just this principle of the montage of different perspectives that also determines the entire construction of the film. 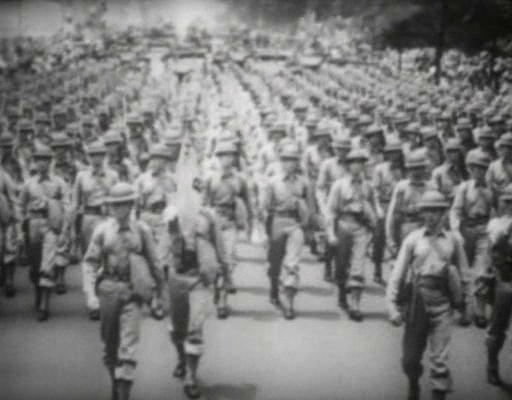 Attempting over and again to find an answer to the film’s opening question, “What put us in the uniform?”, Capra‘s film introduces different cinematic modes of staging from sequence to sequence. Just after the opening the music changes to a spirited march. 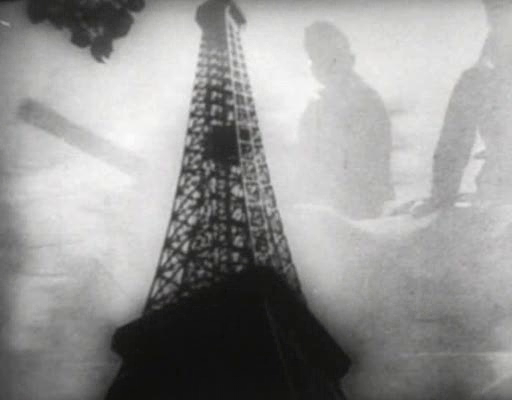 We see a typical cross-section montage, such as those we know from Ruttmann, or even the French avant-garde of the thirties. We see a play with movement and form, reproduced a hundred times, shimmering steel and endless columns of uniform objects: projectiles, airplanes, tanks. Clip 8: Why We Fight: Prelude To War, Frank Capra, USA 1942 (00:03:54 bis 00:04:44). This strict dualism brings in a new mode of argumentation, the logic of melodrama. Within this logic, the world only knows two poles: here the world of good, there the realm of evil. Clip 9: Why We Fight: Prelude To War, Frank Capra, USA 1942 (00:04:27 bis 00:06:48). A few iconographic shots recall the founding acts and fathers of America: paintings, memorials, architecture that represent its democratic institutions. Even in its most impressive appearances, the powers of the state are not an end but a means to uphold the freedom of the political realm. The following sequences show this idea to be diametrically opposed to the enemy‘s idea of the state. In line with this logic, the opening sequence takes up a good ten minutes, which are almost exclusively concerned with the ‘world of slaves', with Italy, Germany, and Japan. 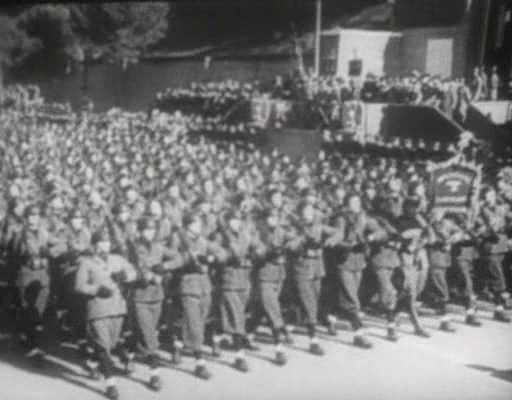 The parallel montage of the appearances of the Duce, the Tenno, and the Führer shows us the masses themselves as a faceless body, responding to the ruler’s theatrical speeches with the same ritual of submission. The triumph of the will of the leaders is completed in the celebration of an ecstatic experience of community. The sequences that follow spell out how this experience of community destroys the fundamental values of freedom. The state lays claim to the entire lives of individuals, to their physical working powers, their beliefs, and even to their children. In place of politics, the force of the state appears: terror. In order to grasp the opposition of terror and politics, Capra shifts the register of representation once again, drawing on yet another mode of genre cinema: The following (?) sequence could easily come from a gangster film of the thirties. 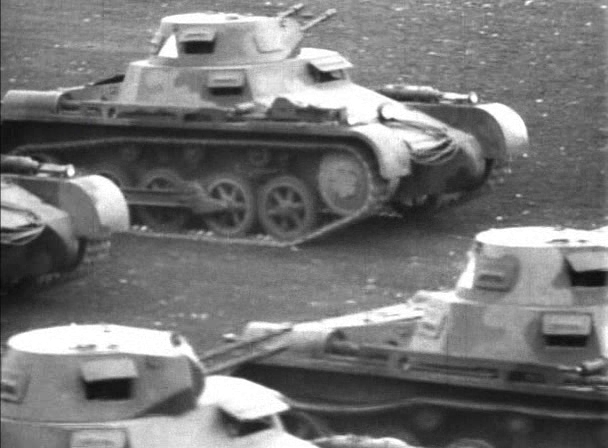 Clip 10: Why We Fight: Prelude To War, Frank Capra, USA 1942 (00:13:53 bis 00:15:22). Then the film once again turns to its own social life, turns once again to America. And again, what is negotiated here is the categorical difference between politics on the one side and the terror of the totalitarian state on the other side. At every stage the American ideal of community is opposed to the fascist one. In place of the freedom of religion we see the glorification of the leader; in place of political difference of opinion we see the beauty of staging state power; in place of politics we see terror; and in place of the ordinary life we see the militarization of social life. Fig. 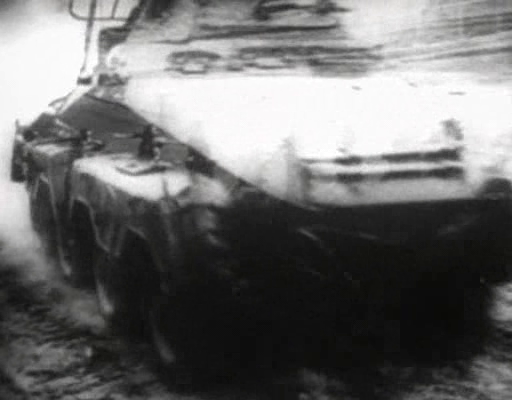 29-34: Stills from WHY WE FIGHT: PRELUDE TO WAR (Frank Capra, USA 1942), Min. 6, 27, 25, 15, 29, 19. The fact that the American way of life is idealized will not have been overlooked, even in wartime. But this is not the question. The question is what ideal of community is offered here in contrast to the fascist one – and which means are used to achieve this. Capra here makes use of a genre that he was the undisputed master of at the time. He proclaims America’s way of life in the sentimental pathos of a family melodrama. He opposes the values of the everyday lives of ordinary people and their personal pursuit of happiness to the heroic pathos of war society. This sentimental pathos marks the fundamental difference between Prelude to War and Day of Freedom. This difference forms the basis for Capra’s strategy of decomposing the opponent’s propaganda. In fact, Capra’s cinematographic analyses precisely seem to capture the idea of community that the pathos of Riefenstahl’s films is based on. In continually new variations, they show how state power is founded on the ritual negation of the individual. They show the formation of the masses into an ornamental representation of the power of their leader. They show the obliteration of the ordinary individual in favor of the military community. Finally they show the war itself as the mode of fascist community building. Fig. 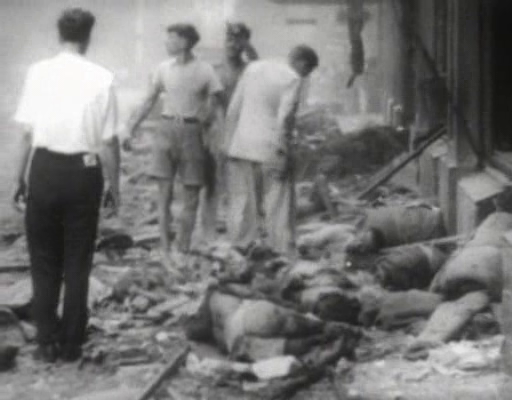 35-37: Stills from WHY WE FIGHT: PRELUDE TO WAR (Frank Capra, USA 1942), Min. 20, 20, 21. 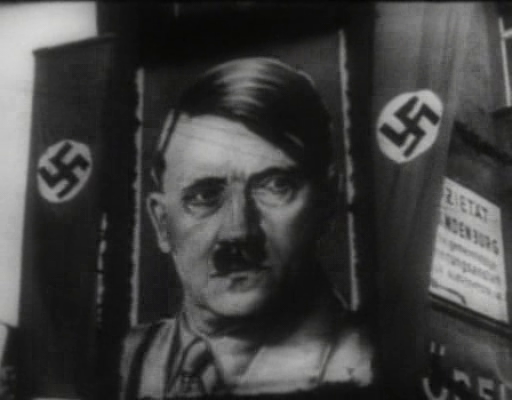 To conclude: Capra and Riefenstahl each propagate an ideal of community, but they could not be more opposed. 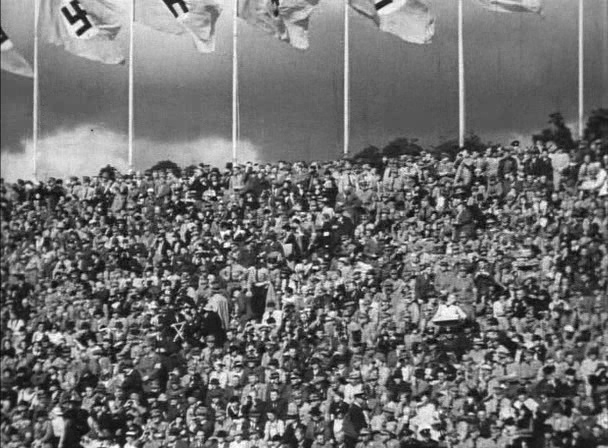 Riefenstahl uses the avant-garde art of montage to construct a homogenous perceptual perspective. She aims to fulfill the idea of a heroic artwork, one which would allow the spectator to take part in the staging of the power of the state. The spectator shares the Führer‘s gaze, the elevated strategic position of the commander‘s hill that turns war into a spectacle, that takes pleasure in the annihilation of the individual and the birth of an ethnic people‘s community. 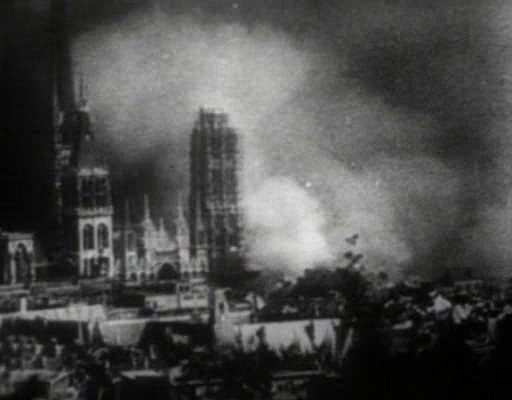 The film creates an audience that can enjoy the beauty of a tragedy illuminated by the aesthetics of the classical film avant-garde. Capra, on the other hand, multiplies the perspectives and standpoints by using montage to juxtapose highly heterogeneous modes of representation. Each of these modes has a different perspective, a different affective stance to the world: the montage of association, the cross-section montage, the mode of melodrama, and that of the gangster film. This multiplication of perspectives confronts the heroic self-representation of the fascist state with the clash between opposing subjective stances and affective positionings. 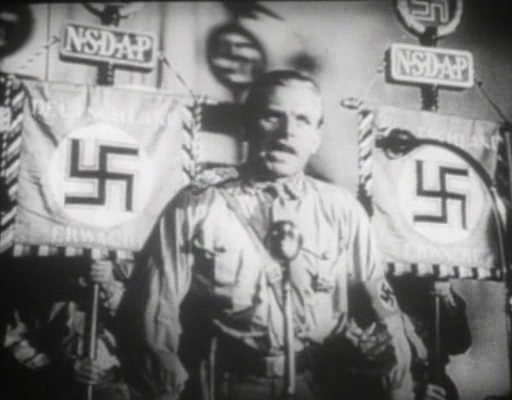 Capra uses the representational modes of the cinema to lay bare the ideal of community in the enemy’s propaganda films and in the same stroke to mobilize the moral judgments of his people, and thus also their sense of community. This implies the emphatic idea of political argument. Arendt, Hannah (1992) Lectures on Kant's Political Philosophy, Chicago, IL: Univ. of Chicago Press. Arendt, Hannah (1963) On Revolution, New York, NY: The Viking Press. Arendt, Hannah (1958) The Human Condition, Chicago, IL, Univ. of Chicago Press. Basinger, Jeanine (2003) The World War II Combat Film. Anatomy of a Genre, Middletown, CT, Wesleyan Univ. Press. Cavell, Stanley (2004) Cities of Words. Pedagogical Letters on a Register of the Moral Life, Cambridge, MA; London, Harvard Univ. Press. Rancière, Jacques (2004) The Politics of Aesthetics. The Distribution of the Sensible, London/New York, NY, 2004. Rorty, Richard (1998) Achieving Our Country. Leftist Thought in Twentieth-Century America, Cambridge, MA, Harvard Univ. Press. TAG DER FREIHEIT - UNSERE WEHRMACHT (D 1935), dir. Leni Riefenstahl. DVD-Quelle: QuickBand Networks 2000, distributed by Warner Home Video. WHY WE FIGHT: PRELUDE TO WAR (USA 1942), dir. Frank Capra. DVD-Quelle: GoodTimes Home Video Corp. 2000.